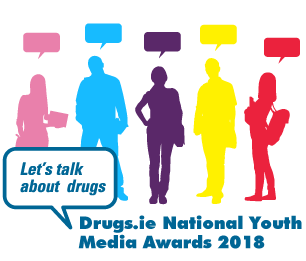 The Drugs.ie 'Let's Talk about Drugs' National Youth Media Awards is an annual competition which encourages discussion of drug-related issues by inviting young people to produce a piece of original content relating to drug and/or alcohol use. Download the document in the below link for more information. Submit your entry along with a completed entry form. See the Enter the competition page for further details. Age categories for entries are: 12-14; 15-17; 18-21; 22-25. The themes for 2018 are divided into two categories. Posters for the two categories can be found at the Competition launch and resources page. The deadline for entries has been extended until the 9th of April 2018. Each category winner will receive €250 One4all gift card. There will be an overall winner selected from the 12-17 and the 18-25 categories. Each overall winner will receive €1,000 One4all gift card. Judging will take place in February 2018. It is anticipated that the awards ceremony will be held in April 2018 in Dublin. We are grateful to the following for their support in 2018: The HSE National Social Inclusion Office; The Drug Programmes and Policy Unit in the Department of Health; Healthy Ireland; and The Ana Liffey Drug project.